Well, thank goodness for Nathaniel's suggestion to push our daily posting time to 1:00. Now I'm just trying my best not to miss that (self-imposed) deadline. We'll see how I do. There are more comics than usual on my list for today, and there's one big Marvel hardcover that I'm really interested in. But I'll get to that in a minute. First, I'd like to direct your attention to one of the most interesting comics-centric interviews I've read in a very long time. Conducted by independent publisher Seraphemera, this interview features the one and only Alan Moore. In the piece, the legendary creator of Watchmen, V for Vendetta, and countless others, talks about a whole mess of things. Most interesting among them, however, are his feelings about the recently announced prequels to Watchmen, coming soon from DC. Moore, as you might expect, is not happy about the books, and he is certainly not shy about telling it exactly as he sees it. While I may not agree with his views on the current comics landscape being devoid of talent, I do sympathize with his feelings of ownership and how he feels cheated out of his creation. Do yourself a favor and check out the full interview--it is fascinating reading, I promise. You can find it right here. Well, book. From Marvel, we have the hardcover collection of Avengers: Children's Crusade, a nine-part series that had a somewhat...rocky...shipping schedule when it was releasing as single issues. From Young Avengers creators Allan Heinberg and Jim Cheung (who provides breathtaking art for the series), Children's Crusade was a book that I knew wouldn't ship on time, and so decided to pass on until the story was eventually collected. 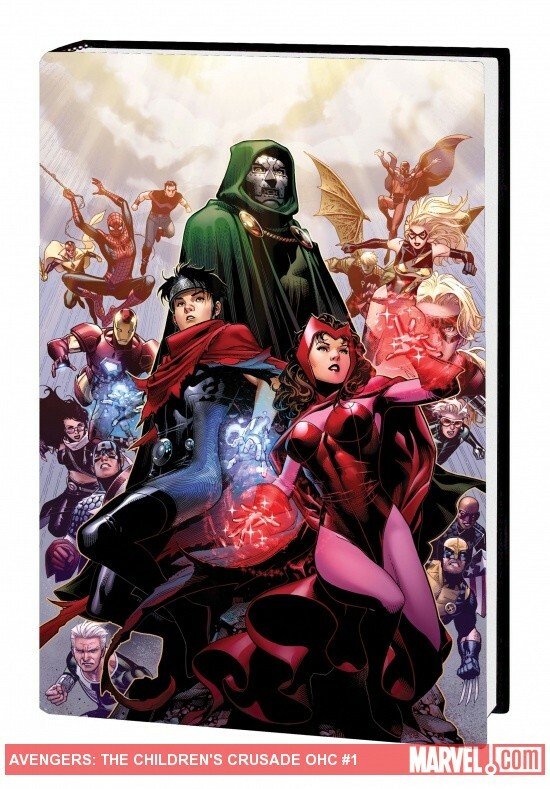 The Young Avengers return in an epic saga by series creators Allan Heinberg and Jim Cheung! When Wiccan’s reality-altering powers begin to rival those of the Scarlet Witch, the young hero sets out on a quest to find her that spans the Marvel Universe and pits Wiccan against both the Avengers and the Young Avengers. But will Wiccan’s desire to solve the mystery of his parentage be his salvation or his undoing? With three words, the Scarlet Witch changed the world forever — and with her return, nothing will ever be the same for the Marvel Universe. This self-contained event reintroduces and redefines the Young Avengers and the Scarlet Witch for the Heroic Age, and is essential reading for any Avengers fan. Reviews of this book have been overwhelmingly positive, and I can honestly say that this is the Marvel book I'm most looking forward to reading. It's a bit pricey, but it's over-sized and it contains quite a bit of content. While Heinberg's and Cheung's track record for turning out stories in a timely fashion may not be stellar, their work speaks for itself, and I really can't wait to get my hands on this title. So, hey. It's just a couple minutes after 1:00, and I'm pretty much done with this post. Before I hit that orange PUBLISH button, though...what are you Waiting for?